Pointwise has moved its library of Glyph scripts to GitHub, a web-based version of the Git revision control system, to improve your user experience. Among the benefits is the ability to subscribe to your favorite scripts, allowing you to track every script modification and receive notifications on development progress or new version information. The Glyph Script Exchange home page can now be found at pointwise.github.com. 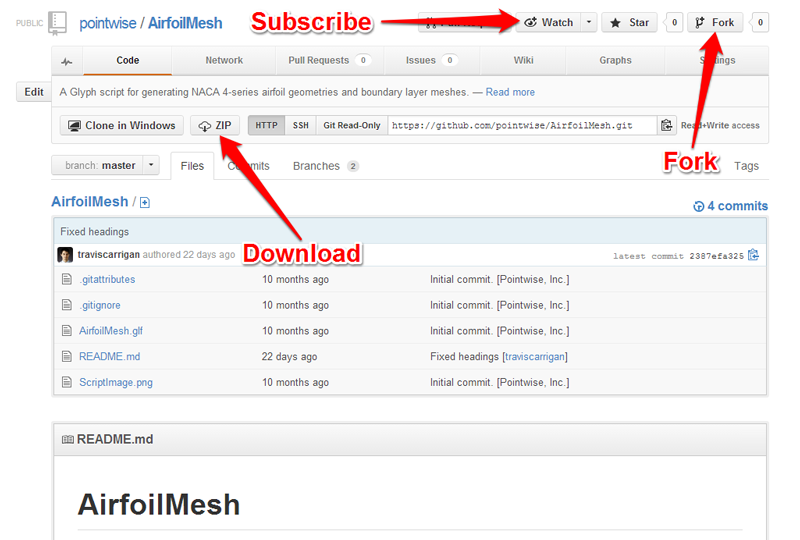 Pointwise's GitHub profile page is where scripts will be hosted. 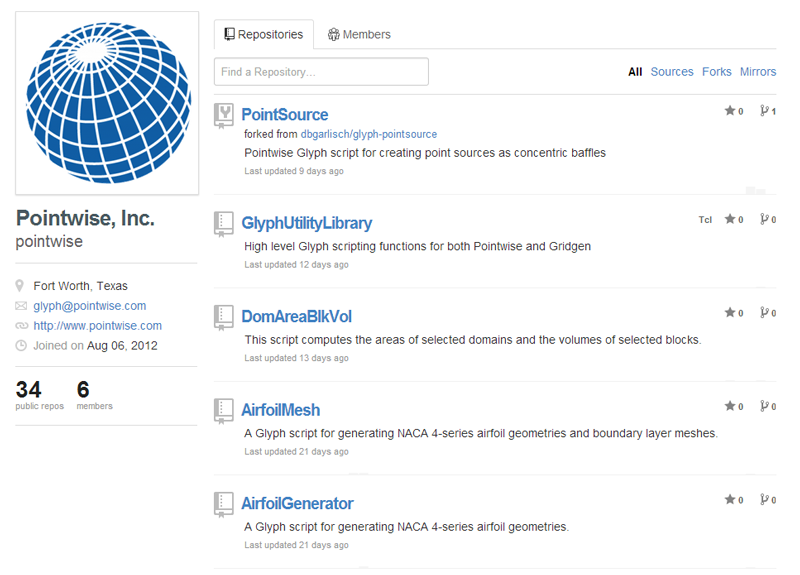 Scripts are hosted on our official Pointwise organization profile page at github.com/pointwise. Just click on a script's name to go to its page. Download a script to use it immediately, or fork a script to make modifications and create new products. The good news is that you can download scripts from the Glyph Script Exchange even if you don't have a GitHub account (although there are benefits if you do). You download a script by pressing the ZIP button. Pressing Star (upper right) marks a script as a favorite. If you're logged in to your GitHub account, pressing Watch creates a “subscription” to that script and you'll be notified of new versions and updates. Fork lets you make a copy of that script in your GitHub account so that you can modify it within GitHub. If you've written your own Glyph script and posted it to GitHub, you can contribute it to the Script Exchange by emailing us at glyph@pointwise.com. Once we've had an opportunity to review your script, we'll fork your original script and it will show up on Pointwise's profile page. Glyph is Pointwise's Tcl-based scripting language that offers the ability to automate your meshing process by writing templates and macros. The library of scripts developed over the years in-house or by Pointwise users formerly was hosted on Pointwise's website. An archive of all scripts as of the time of the migration to GitHub is maintained at www.pointwise.com/glyph. Also, you should note that only Pointwise (Glyph 2) scripts were migrated to GitHub. All Gridgen (Glyph 1) scripts remain at www.pointwise.com/glyph.